self-efficacy based interventions should be promote. 2050 (National Population Council [CONAPO], 2010). Martinez, 1999; Romero-Martínez et al., 2012). Scheier, & Weintraub, 1989; Lazaruz & Folkman, 1984). control (Samuel-Hodge, Watkins, Rowell, & Hooten, 2008). reduction) a group of elderly Mexicans citizens use. 20% in any of the instruments. while 23.5% were living without a partner but with others. use only for research purposes. Signed the informed consent, the interview was conducted. items, α = .63) and religious faith coping (6 items, α = .55). which the higher the score the greater the use of the strategy. to a 0 to 100 scale with the Equation (1). rs = raw score ni = number of items. 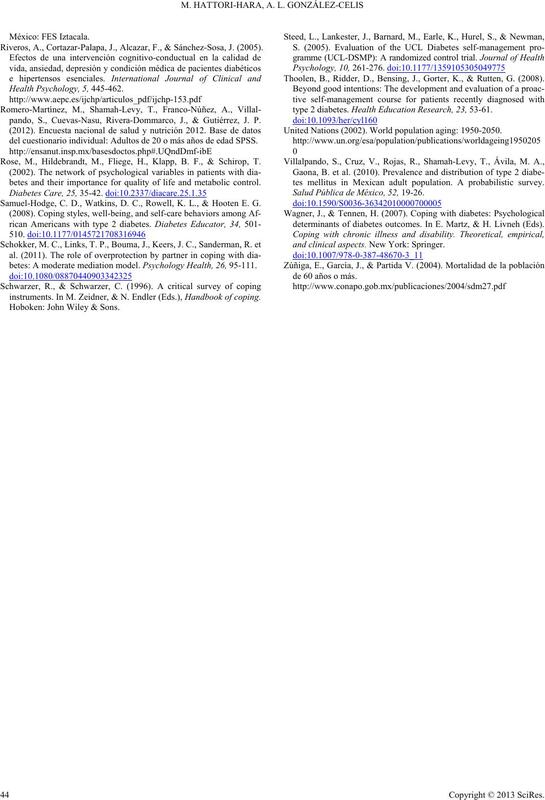 56.95%, a total reliability Cro nbach Al pha of .82.
gle factor which was called self-efficacy in risk regulation. reation and .51 in religious faith. faith, followed by active coping and finally depressive coping. people fluctuates more in this area than in the others. ˂ .01) were significantly correlated with total self-efficacy. self-efficacy factor, but if there were some, it would be negative. 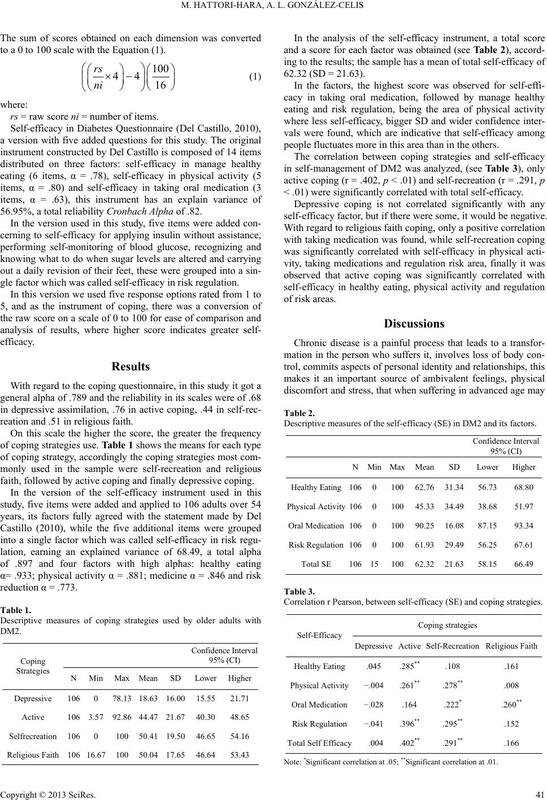 Descriptive measures of the self-efficacy (SE) in DM2 and its factors. 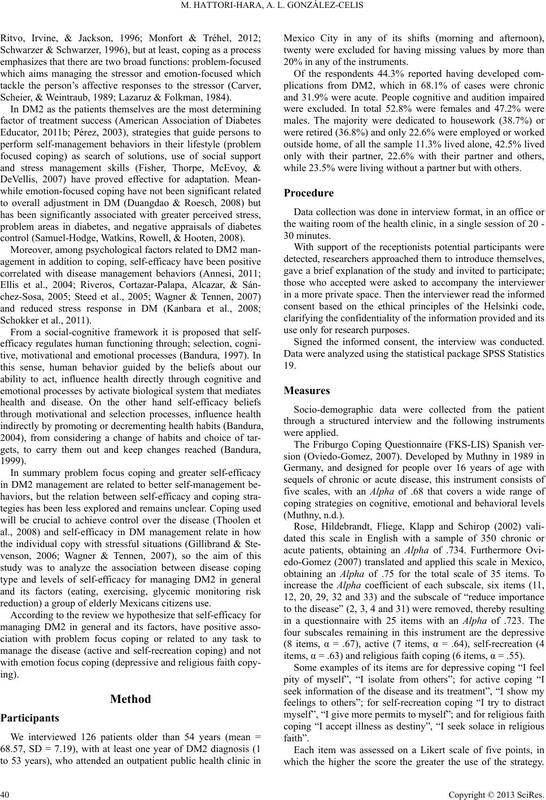 Correlation r Pearson, between self-efficacy (SE) and coping strategies. Note: *Significant correlation at .05; **Significant correlation at .01.
optimum fit to both processes. ment) that seemed complicated and secondary to the treatment. assess them as more threatening and difficult to adopt. feelings, set goals and implement strategies to achieve them. being and self-esteem, may help DM2 management. strategies of coping should be expected and promoted. but not with active coping. self-efficacy for managed eating. Psyc ho l o gy , 2, 694-699.
de la sociedad actual? España: Desclée De Brouwer. man self-development, adaptation and change. In M. Salanova, R.
telló de la Plana: Universitat Jaume. 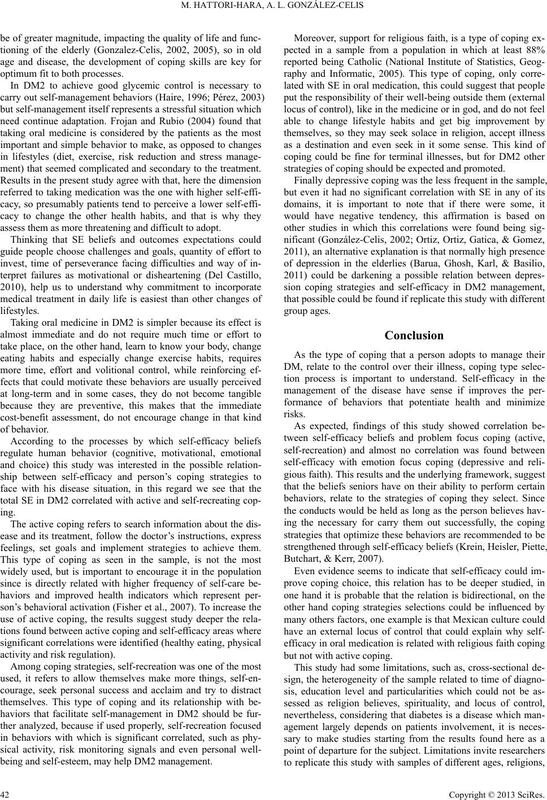 and Social Psychology, 56, 267-283.
cia y bienestar psicológico en pacientes con diabetes tipo 2. Ph.D.
Thesis, México DF: Facultad de Psicología, UNAM. review and appraisal. 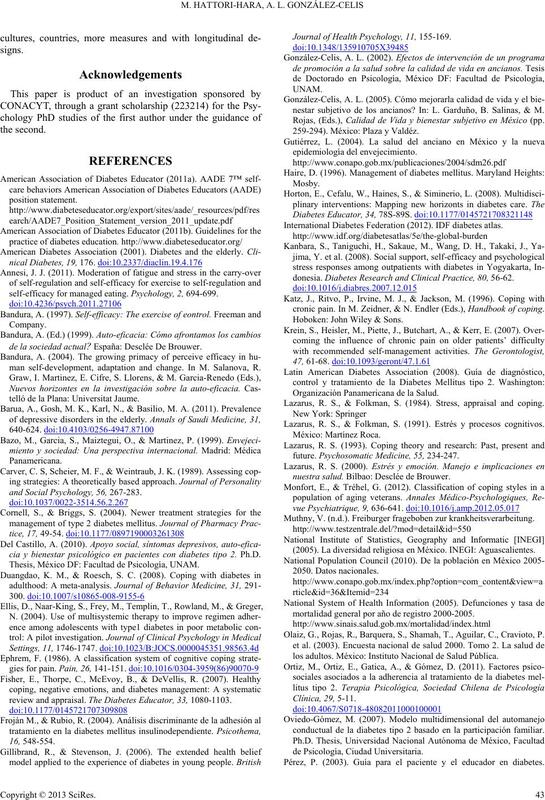 The Diabetes Educator, 33, 1080-1103. 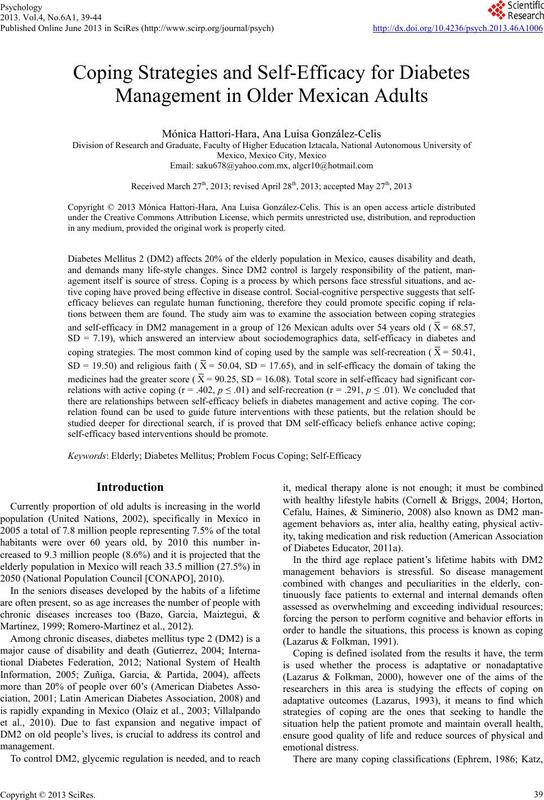 Journal of Health Psychology, 11, 155-169.
nestar subjetivo de los ancianos? In: L. Garduño, B. Salinas, & M.
Rojas, (Eds. ), Calidad de Vida y bienestar subjetivo en México (pp. 259-294). México: Plaza y Valdéz. International Diabetes Federation (2012). IDF diabetes atlas. donesia. Diabetes Res e a r c h a nd C l i nical Practice, 80, 56-62.
cronic pain. In M. Zeidner, & N. Endler (Eds. ), Handbook of coping. Hoboken: John Wiley & Sons. Lazarus, R. S., & Folkman, S. (1984). Stress, appraisal and coping. Lazarus, R. S., & Folkman, S. (1991). Estrés y procesos cognitivos. future. Psychoso m a t i c M e dicine, 55, 234-247.
nuestra salud. Bilbao: Desclée de Brouwer. Muthny, V. (n.d.). Freiburger frageboben zur krankheitsverarbeitung. (2005). La diversidad religiosa en México. INEGI: Aguascalientes. mortalidad general por año de registro 2000-2005. Olaiz, G., Rojas, R., Barquera, S., Shamah, T., Aguilar, C., Cravioto, P.
los adultos. México: Instituto Nacional de Salud Pública. conductual de la diabetes tipo 2 basado en la participación familiar. Pérez, P. (2003). Guía para el paciente y el educador en diabetes. Riveros, A., Cortazar-Palapa, J., Alcazar, F., & Sánchez-Sosa, J. (2005). pando, S., Cuevas-Nasu, Rivera-Dommarco, J., & Gutiérrez, J. P.
del cuestionario individual: Adultos de 20 o más años de edad SPSS. Rose, M., Hildebrandt, M., Fliege, H., Klapp, B. F., & Schirop, T.
betes and their importance for quality of life and metabolic control. Samuel-Hodge, C. D., Watkins, D. C., Rowell, K. L., & Hooten E. G.
betes: A moderate mediation model. Psychology Health, 26 , 95-111.
instruments. In M. Zeidner, & N. Endler (Eds. ), Handbook of coping. Thoolen, B., Ridder, D., Bensing, J., Gorter, K., & Rutten, G. (2008). type 2 diabetes. Health Education Research, 23, 53-61. United Nations (2002). World population aging: 1950-2050.
tes mellitus in Mexican adult population. A probabilistic survey. Salud Pública de México, 52, 19-26.
determinants of diabetes outcomes. In E. Martz, & H. Livneh (Eds). and clinical aspects. New York: Springer.